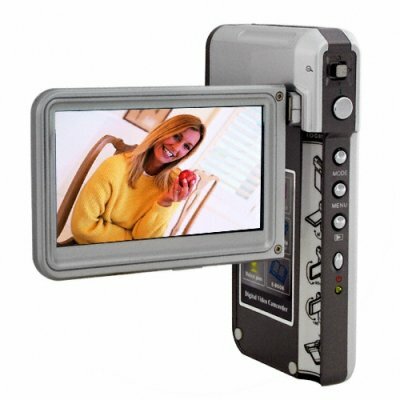 Successfully Added 5MP Sleek Photo and Video Camera with 3 Inch Swivel Screen to your Shopping Cart. Awesome photo and DV camera brought to you at a wholesale direct from the factory price. This sleek little clamshell style unit is sure to impress. With its fold out swivel screen, 5 MP CMOS sensor, built in flash, 30 FPS video capture, PictBridge compatibility and 4:3 or 16:9 capture options, you could say that this model has got a world of features all crammed into an attractive little silver package. The rear thumbstick is easy to control while holding the camera to allow easy setting and mode changes while in use and the widescreen display clearly shows all the activated features as well as your subject in brilliant color. Buy stock today at our great wholesale prices and re-sell for even greater profits to potentially millions of customers on eBay, UBid, Amazon or your own storefront and make use of Chinavasion's efficient drop shipping services for maximum convenience. Four days to ship this product from China to Harnosand in Sweden!Thats impressive! The camera looks ok! I've used it for one day and it works great!No problem with the software installation!I'll be back with a new review when I used it for a month or so!